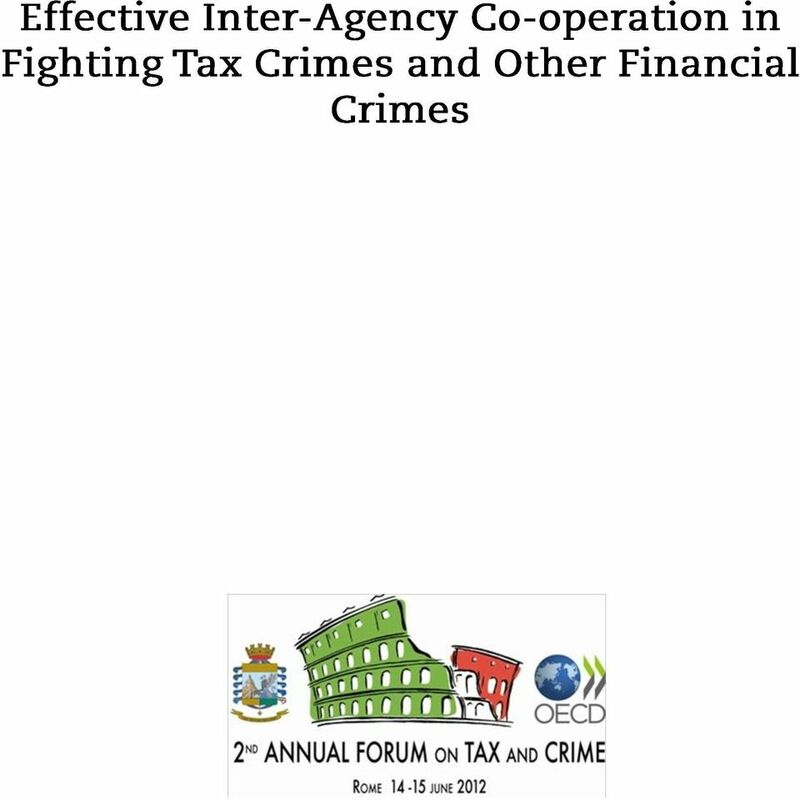 Download "Effective Inter-Agency Co-operation in Fighting Tax Crimes and Other Financial Crimes. Co-operation in Fighting Tax Crimes and Other Financial Crimes"
3 ORGANISATION FOR ECONOMIC CO-OPERATION AND DEVELOPMENT The OECD is a unique forum where governments work together to address the economic, social and environmental challenges of globalisation. The OECD is also at the forefront of efforts to understand and to help governments respond to new developments and concerns, such as corporate governance, the information economy and the challenges of an ageing population. The Organisation provides a setting where governments can compare policy experiences, seek answers to common problems, identify good practice and work to co-ordinate domestic and international policies. The OECD member countries are: Australia, Austria, Belgium, Canada, Chile, the Czech Republic, Denmark, Estonia, Finland, France, Germany, Greece, Hungary, Iceland, Ireland, Israel, Italy, Japan, Korea, Luxembourg, Mexico, the Netherlands, New Zealand, Norway, Poland, Portugal, the Slovak Republic, Slovenia, Spain, Sweden, Switzerland, Turkey, the United Kingdom and the United States. The European Commission takes part in the work of the OECD. 6 BACKGROUND AND INTRODUCTION 5 Background and Introduction Financial crimes are growing in sophistication and criminals accumulate significant sums of money through offences such as drug trafficking, investment fraud, extortion, corruption, embezzlement, tax evasion and tax fraud. The nature of financial crime means that the same activity may violate a number of different laws. Different government agencies may be involved at various stages of tackling financial crimes, including the prevention, detection, investigation and prosecution of offences and the recovery of the proceeds of crime. Tax offences are often intrinsically linked to other financial crimes as criminals fail to report their income from illicit activities for tax purposes. Conversely, criminals may over-report income in an attempt to launder the proceeds of crime. The Financial Action Task Force ( FATF ) has explicitly recognised the linkages between tax crimes and money laundering by adding tax crimes to the list of designated predicate offences for money laundering purposes in the 2012 update of its Recommendations. Where criminal activity does cross national boundaries, the amounts involved can be staggering. A 2011 UNODC report 1 estimates that in 2000 to 2009 total proceeds from transnational organised crime was the equivalent of 1.5% of global GDP, or 870bn USD in Issues of financial crime are of concern to all countries, but particularly to developing countries. Illicit financial flows resulting from financial crimes strip resources from developing countries that could finance their long-term development. Although it is difficult to estimate the total amounts at stake, experts agree that the amounts at stake are vast. The OECD has been active in this area for many years. As early as 1998 work was initiated in response to a call by G7 Finance Ministers which encouraged international action to enhance the capacity of anti-money laundering systems to deal effectively with tax related crimes. The OECD and the FATF subsequently strengthened co-operation in areas of mutual concern and, since 2003, the OECD has held Observer status at FATF meetings. In July 2009, the G8 Leaders called for further efforts in combating illicit financing, and acknowledged the progress being made by the FATF in improving the standards for combating money laundering and the financing of terrorism and by the OECD on international standards of transparency. 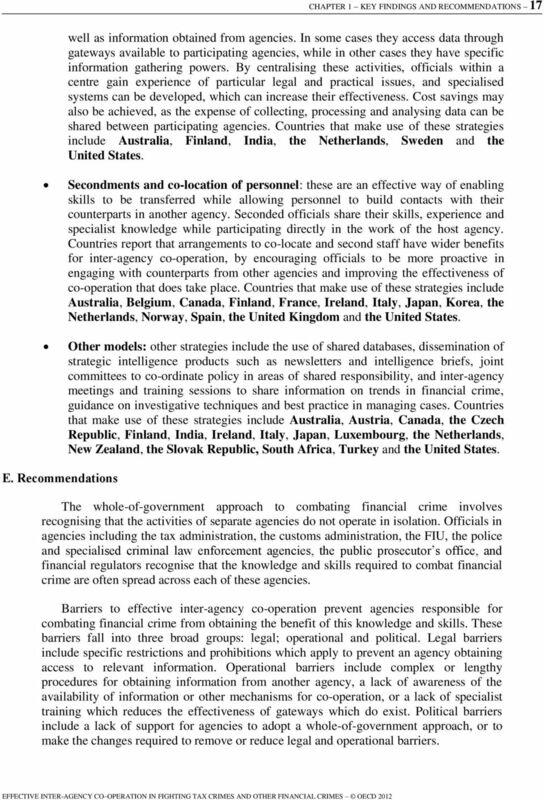 In its and Recommendations, the OECD advocated greater co-operation and better information sharing between different government agencies involved in the fight against financial crimes both domestically and internationally. These 1. United Nations Office on Drugs and Crime, Estimating Illicit Financial Flows from Drug Trafficking and Other Transnational Organized Crimes (October 2011). 2. Recommendation on Tax Measures for Further Combating Bribery of Foreign Public Officials in International Business Transactions. 3. Recommendation to Facilitate Co-operation between Tax Authorities and Other Law Enforcement Authorities to Combat Serious Crimes. 7 6 BACKGROUND AND INTRODUCTION recommendations are reproduced in the box at the end of this chapter. The OECD has also developed practical guidance in the form of handbooks to better enable tax officials to detect bribes and instances of money laundering. 4 These handbooks have been translated into many languages and are being used by tax administrations around the world. It was against this backdrop that Norway hosted the first Tax and Crime Forum held in Oslo in March The purpose of the Forum was to find more effective ways to use a whole-of-government approach to counter financial crimes by harnessing the skills and knowledge of different agencies through better domestic and international co-operation. Inter-agency co-operation can enhance financial integrity and good governance by improving the effectiveness of countries abilities to fight financial crimes. In a world where criminals operate in a complex financial environment and across geographic boundaries, effective domestic and international inter-agency co-operation is the only viable response. The Forum asked the OECD, working with other international organisations and interested parties, to focus on improving inter-agency co-operation by mapping out different models of co-operation, their advantages and challenges with a view to developing best practice standards, and with a particular focus on the contribution that tax administrations can make in this regard. 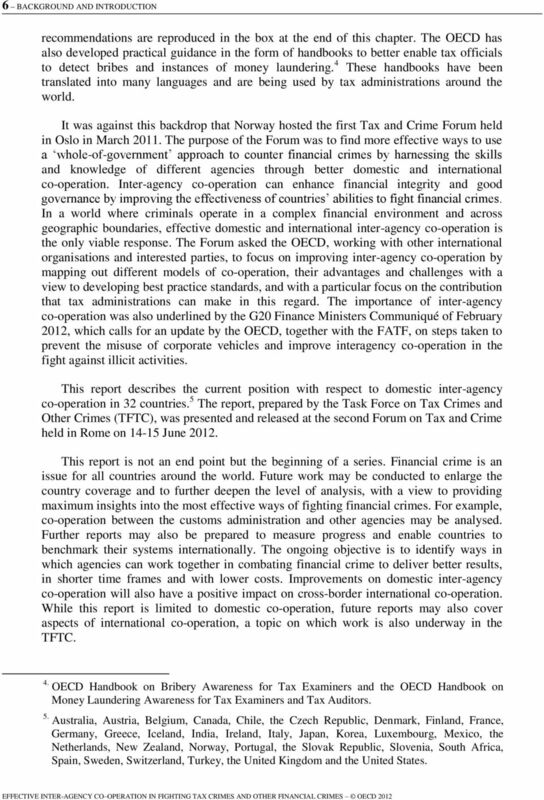 The importance of inter-agency co-operation was also underlined by the G20 Finance Ministers Communiqué of February 2012, which calls for an update by the OECD, together with the FATF, on steps taken to prevent the misuse of corporate vehicles and improve interagency co-operation in the fight against illicit activities. This report describes the current position with respect to domestic inter-agency co-operation in 32 countries. 5 The report, prepared by the Task Force on Tax Crimes and Other Crimes (TFTC), was presented and released at the second Forum on Tax and Crime held in Rome on June This report is not an end point but the beginning of a series. Financial crime is an issue for all countries around the world. Future work may be conducted to enlarge the country coverage and to further deepen the level of analysis, with a view to providing maximum insights into the most effective ways of fighting financial crimes. For example, co-operation between the customs administration and other agencies may be analysed. Further reports may also be prepared to measure progress and enable countries to benchmark their systems internationally. The ongoing objective is to identify ways in which agencies can work together in combating financial crime to deliver better results, in shorter time frames and with lower costs. Improvements on domestic inter-agency co-operation will also have a positive impact on cross-border international co-operation. While this report is limited to domestic co-operation, future reports may also cover aspects of international co-operation, a topic on which work is also underway in the TFTC. 4. OECD Handbook on Bribery Awareness for Tax Examiners and the OECD Handbook on Money Laundering Awareness for Tax Examiners and Tax Auditors. 5. Australia, Austria, Belgium, Canada, Chile, the Czech Republic, Denmark, Finland, France, Germany, Greece, Iceland, India, Ireland, Italy, Japan, Korea, Luxembourg, Mexico, the Netherlands, New Zealand, Norway, Portugal, the Slovak Republic, Slovenia, South Africa, Spain, Sweden, Switzerland, Turkey, the United Kingdom and the United States. 8 BACKGROUND AND INTRODUCTION 7 Box. 1 Recommendation of the OECD Council to Facilitate Co-operation between Tax and Other Law Enforcement Authorities to Combat Serious Crimes 14 October 2010 THE COUNCIL Having regard to Article 5 b) of the Convention on the Organisation for Economic Co-operation and Development of 14 December 1960; Having regard to the Recommendation of the Council on Tax Measures for Further Combating Bribery of Foreign Public Officials in International Business Transactions; Having regard to the Recommendation of the Council concerning the Model Tax Convention on Income and on Capital (hereafter the OECD Model Tax Convention ) Having regard to the Conclusions of the 2010 meeting of the Council at Ministerial level and the Declaration on Propriety, Integrity and Transparency in the Conduct of International Business and Finance Having regard to the Conclusions of the 2009 meeting of the Council at Ministerial level; Having regard to the FATF 40 Recommendations and nine Special Recommendations; Having regard to the 2009 OECD Money Laundering Awareness Handbook for Tax Examiners and Tax Auditors; Considering that tax authorities can play an important role in the detection of all serious crimes and not only foreign bribery; Considering that sharing information by tax authorities with other law enforcement authorities can advance efforts to detect, investigate and prosecute serious crimes; On the proposal of the Committee on Fiscal Affairs; I. RECOMMENDS that Members establish, in accordance with their legal systems, an effective legal and administrative framework and provide guidance to facilitate reporting by tax authorities of suspicions of serious crimes, including money laundering and terrorism financing, arising out of the performance of their duties, to the appropriate domestic law enforcement authorities. II. FURTHER RECOMMENDS that Members consider to include in their bilateral tax treaties, the optional language of paragraph 12.3 of the Commentary to Article 26 of the OECD Model Tax Convention, which allows the sharing of tax information by tax authorities with other law enforcement agencies and judicial authorities on certain high priority matters (e.g. to combat money laundering, corruption, terrorism financing) and reads as follows: Notwithstanding the foregoing, information received by a Contracting State may be used for other purposes when such information may be used for such other purposes under the laws of both States and the competent authority of the supplying State authorises such use. III. INVITES non-members to adhere to this Recommendation. IV. 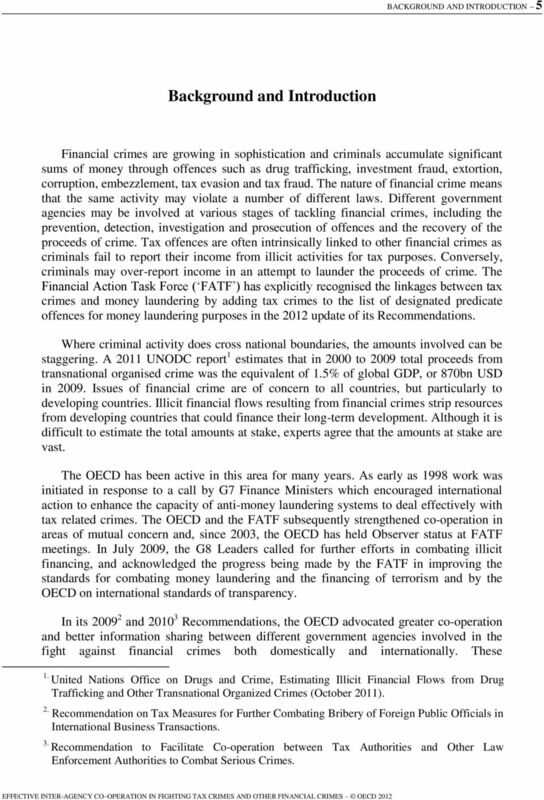 ENCOURAGES all countries to distribute widely within their tax administrations the 2009 OECD Money Laundering Awareness Handbook for Tax Examiners and Tax Auditors. V. INSTRUCTS the Committee on Fiscal Affairs to monitor the implementation of the Recommendation and to promote it in the context of contacts with non-members and to report to Council as appropriate. 9 8 BACKGROUND AND INTRODUCTION Box 2. Recommendation of the Council on Tax Measures for Further Combating Bribery of Foreign Public Officials in International Business Transactions 25 May 2009 THE COUNCIL, Having regard to Article 5, b) of the Convention on the Organisation for Economic Co-operation and Development of 14 December 1960; Having regard to the Recommendation of the Council on the Tax Deductibility of Bribes to Foreign Public Officials (hereafter the "1996 Recommendation"), to which the present Recommendation succeeds; Having regard to the Revised Recommendation of the Council on Bribery in International Business Transactions; Having regard to the Convention on Combating Bribery of Foreign Public Officials in International Business Transactions to which all OECD Members and eight non-members are Parties, as at the time of the adoption of this Recommendation (hereafter the "OECD Anti-Bribery Convention"); Having regard to the Commentaries on the OECD Anti-Bribery Convention; Having regard to the Recommendation of the Council concerning the Model Tax Convention on Income and on Capital (hereafter the "OECD Model Tax Convention"); Welcoming the United Nations Convention Against Corruption to which most parties to the OECD Anti-Bribery Convention are State parties, and in particular Article 12.4, which provides that "Each State Party shall disallow the tax deductibility of expenses that constitute bribes"; Considering that the 1996 Recommendation has had an important impact both within and outside the OECD, and that significant steps have already been taken by governments, the private sector and non-governmental agencies to combat the bribery of foreign public officials, but that the problem still continues to be widespread and necessitates strengthened measures; Considering that explicit legislation disallowing the deductibility of bribes increases the overall awareness within the business community of the illegality of bribery of foreign public officials and within the tax administration of the need to detect and disallow deductions for payments of bribes to foreign public officials; and Considering that sharing information by tax authorities with other law enforcement authorities can be an important tool for the detection and investigation of transnational bribery offences; On the proposal of the Committee on Fiscal Affairs and the Investment Committee; I. 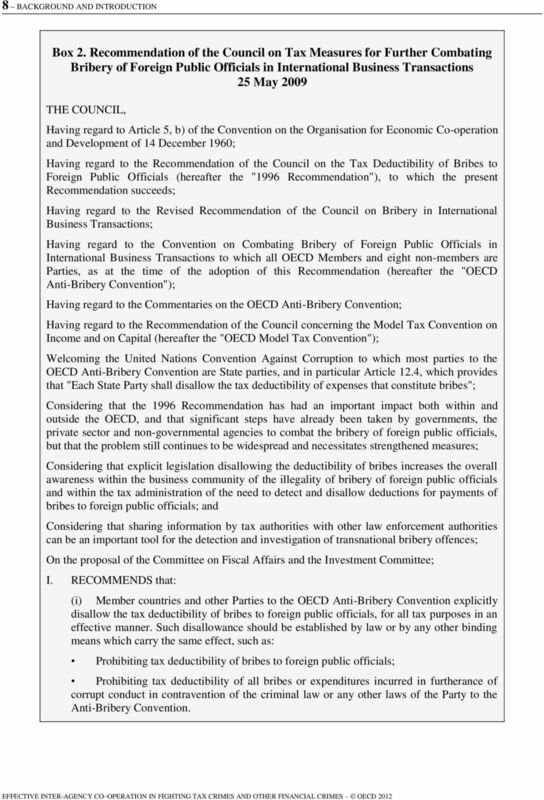 RECOMMENDS that: (i) Member countries and other Parties to the OECD Anti-Bribery Convention explicitly disallow the tax deductibility of bribes to foreign public officials, for all tax purposes in an effective manner. Such disallowance should be established by law or by any other binding means which carry the same effect, such as: Prohibiting tax deductibility of bribes to foreign public officials; Prohibiting tax deductibility of all bribes or expenditures incurred in furtherance of corrupt conduct in contravention of the criminal law or any other laws of the Party to the Anti-Bribery Convention. 10 BACKGROUND AND INTRODUCTION 9 Box 2. 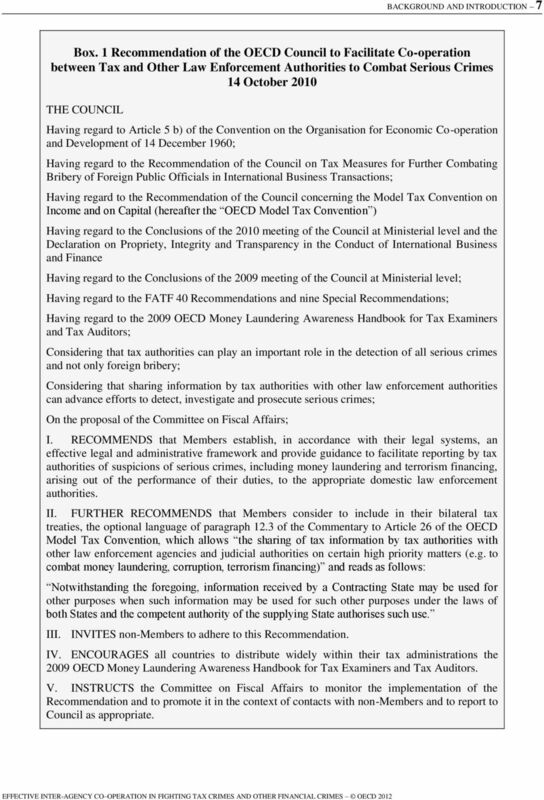 Recommendation of the Council on Tax Measures for Further Combating Bribery of Foreign Public Officials in International Business Transactions 25 May 2009 (cont.) Denial of tax deductibility is not contingent on the opening of an investigation by the law enforcement authorities or of court proceedings. (ii) Each Member country and other Party to the OECD Anti-Bribery Convention review, on an ongoing basis, the effectiveness of its legal, administrative and policy frameworks as well as practices for disallowing tax deductibility of bribes to foreign public officials. These reviews should assess whether adequate guidance is provided to taxpayers and tax authorities as to the types of expenses that are deemed to constitute bribes to foreign public officials, and whether such bribes are effectively detected by tax authorities. (ii) Each Member country and other Party to the OECD Anti-Bribery Convention review, on an ongoing basis, the effectiveness of its legal, administrative and policy frameworks as well as practices for disallowing tax deductibility of bribes to foreign public officials. These reviews should assess whether adequate guidance is provided to taxpayers and tax authorities as to the types of expenses that are deemed to constitute bribes to foreign public officials, and whether such bribes are effectively detected by tax authorities. 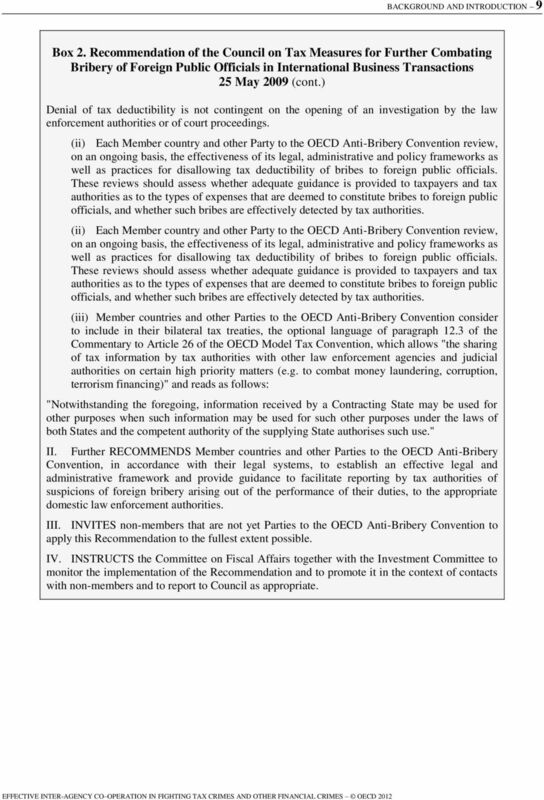 (iii) Member countries and other Parties to the OECD Anti-Bribery Convention consider to include in their bilateral tax treaties, the optional language of paragraph 12.3 of the Commentary to Article 26 of the OECD Model Tax Convention, which allows "the sharing of tax information by tax authorities with other law enforcement agencies and judicial authorities on certain high priority matters (e.g. to combat money laundering, corruption, terrorism financing)" and reads as follows: "Notwithstanding the foregoing, information received by a Contracting State may be used for other purposes when such information may be used for such other purposes under the laws of both States and the competent authority of the supplying State authorises such use." II. 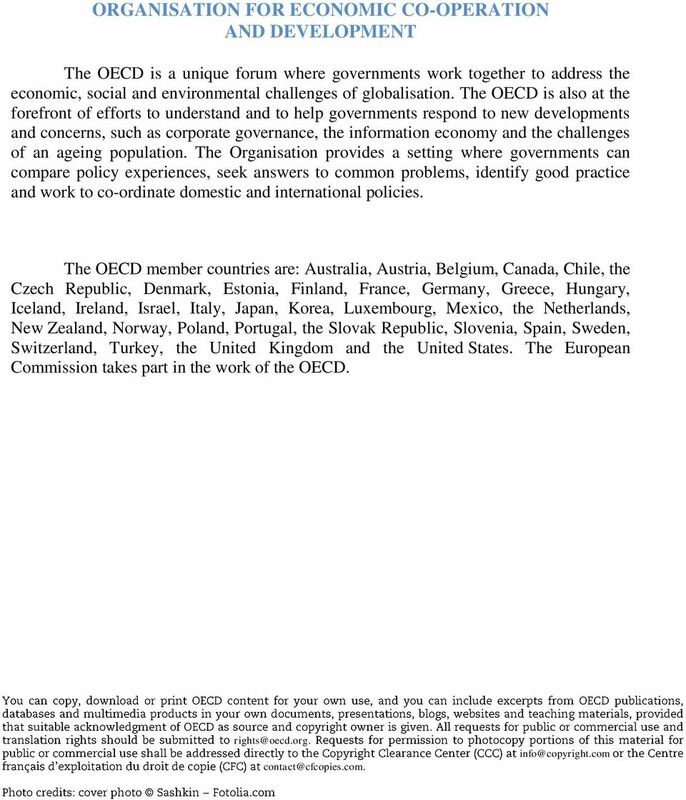 Further RECOMMENDS Member countries and other Parties to the OECD Anti-Bribery Convention, in accordance with their legal systems, to establish an effective legal and administrative framework and provide guidance to facilitate reporting by tax authorities of suspicions of foreign bribery arising out of the performance of their duties, to the appropriate domestic law enforcement authorities. III. INVITES non-members that are not yet Parties to the OECD Anti-Bribery Convention to apply this Recommendation to the fullest extent possible. IV. INSTRUCTS the Committee on Fiscal Affairs together with the Investment Committee to monitor the implementation of the Recommendation and to promote it in the context of contacts with non-members and to report to Council as appropriate. 12 CHAPTER 1 KEY FINDINGS AND RECOMMENDATIONS 11 Chapter 1 Key Findings and Recommendations A. 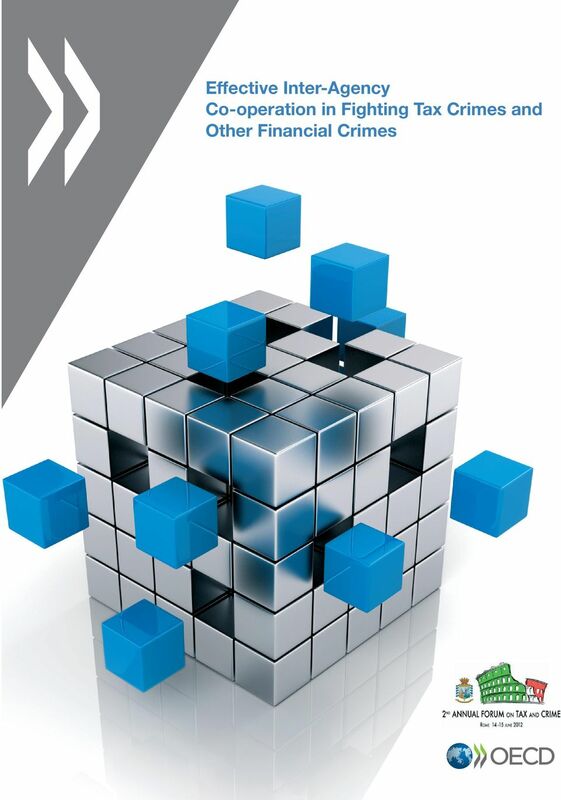 In general The report identifies key agencies involved in the different stages of combating financial crime. It considers the organisational models for these agencies adopted in different countries. These models form the framework around which arrangements for inter-agency co-operation are built. Taking into account the different agency models applied, the report identifies flows of information that are particularly important in enabling these agencies to operate effectively in combating financial crime. It describes the broad position with respect to the existence of legal gateways in countries to enable these flows to take place, as well as any particular barriers or impediments that exist. While the ability to share information is a necessary condition for inter-agency co-operation, many countries have gone further and have put in place enhanced forms of co-operation to make optimal use of these gateways and the report describes the arrangements for enhanced co-operation currently in place. B. Organisational models for agencies fighting tax crimes and other financial crime Strategies for combating financial crimes comprise a number of key stages, including the prevention, detection, investigation and prosecution of offences, and the recovery of the proceeds of crime. 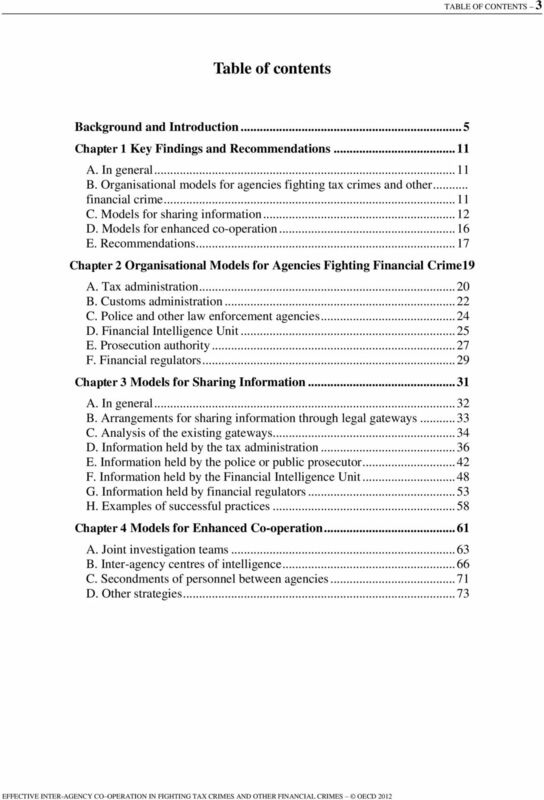 Depending upon the circumstances, these strategies can involve a number of government agencies, including the tax administration; the customs administration; anti-money laundering authorities including the Financial Intelligence Unit ( FIU ); the police and specialised law enforcement agencies; the public prosecutor s office; and financial regulators. A range of organisational models exist for structuring each of these agencies and allocating competences among them. Some of these models are long-standing and were established as a country s framework for law enforcement was developed. Other models reflect more recent policy decisions. Each organisational model has distinct features which need to be taken into account when developing strategies for inter-agency co-operation, so as to ensure that the full benefits of co-operation are achieved. Which agency has responsibility for a particular activity will directly impact the processes and agreements required to achieve a desired benefit from co-operation. For instance, looking at ways countries have allocated responsibilities for countering tax crime the Report identifies the following four models: Model 1: the tax administration has responsibility for directing and conducting investigations. This model is applied in Australia, Canada, Germany, Greece, India, Ireland, Korea, New Zealand, South Africa, Switzerland, the United Kingdom and the United States. 13 12 CHAPTER 1 KEY FINDINGS AND RECOMMENDATIONS Model 2: the tax administration has responsibility for conducting investigations, under the direction of the public prosecutor. This model is applied in Austria, Chile, the Netherlands, Portugal, Sweden, Spain and the United States. In Spain investigations are currently directed by an examining judge. Model 3: a specialist tax agency, under the supervision of the Ministry of Finance but outside the tax administration, has responsibility for conducting investigations. This model is applied in Greece, Iceland and Turkey. Model 4: the police or public prosecutor has responsibility for conducting investigations. This model is applied in Belgium, the Czech Republic, Denmark, Finland, France, Japan, Luxembourg, Mexico, Norway, the Slovak Republic and Slovenia. Italy is not included in the four models set out above. In Italy, responsibility for carrying out investigations into financial crimes, including tax crimes, sits with the Guardia di Finanza, which can conduct such investigations both independently and also under the direction of the public prosecutor. The Guardia di Finanza is also able to carry out civil tax investigations and audits in accordance with its own administrative powers. The United States is included in both Model 1 and Model 2, to reflect two types of criminal investigations. The first is an administrative investigation, which is conducted by a tax administration employee and the case is then referred to a prosecutor. The second is a Grand Jury investigation which is initiated and worked under the direction of a prosecutor from the inception of the investigation. In Greece, tax offences may be investigated by the tax administration or by the Economic Crimes Enforcement Agency (SDOE), which sits under the Ministry of Finance. Greece is therefore included under both Model 1 and Model 3. C. Models for sharing information In the course of their activities, different government agencies collect and hold information on individuals, corporations and transactions which may be directly relevant to the activities of other agencies in combating financial crime. Mechanisms to enable this information to be shared improve the prevention and detection of financial offences, enable investigations to be conducted more effectively and efficiently, result in faster and more successful prosecutions, and increase the likelihood of the proceeds of crime being recovered. In order for information to be shared, legal gateways must exist between the relevant agencies. Conditions and exceptions can be applied to different forms of arrangement and gateways may provide for different arrangements to apply in different circumstances. Under all types of co-operation with respect to sharing information among different agencies, it is important to protect the confidentiality of information and the integrity of work carried out by other agencies. The Report identifies four different types of co-operation with respect to sharing information among different agencies: (i) direct access to information contained in agency records or databases; (ii) an obligation to provide information spontaneously (sometimes expressed as a reporting obligation ); (iii) an ability, but not an obligation, to provide information spontaneously; and (iv) an obligation or ability to provide information only on request. 14 CHAPTER 1 KEY FINDINGS AND RECOMMENDATIONS 13 On this basis, countries provided information on their current legal gateways for information sharing, placing them in categories 0 to 4. This report analyses the existence of gateways which allow, oblige or prevent the tax administration, the police (and related law enforcement agencies), the FIU and financial regulators to share information with other agencies in certain situations. It analyses 13 possible flows of information. The analysis is not meant to be an evaluation of the effectiveness of the gateways in a given country, but simply represents an overview of the legal gateways that are in place. In addition, it does not necessarily indicate that in all cases a legal gateway in one category is in practice more effective than one in another category. For example, spontaneous sharing of information may be very effective when there is a long-standing co-operative relationship between the agencies involved, and there is a clear understanding of what information may be useful in the activities of the recipient agency. On the other hand, direct access to information may be less effective in cases where officials are unfamiliar with the information available or have not received appropriate training in using systems operated by the other agency. 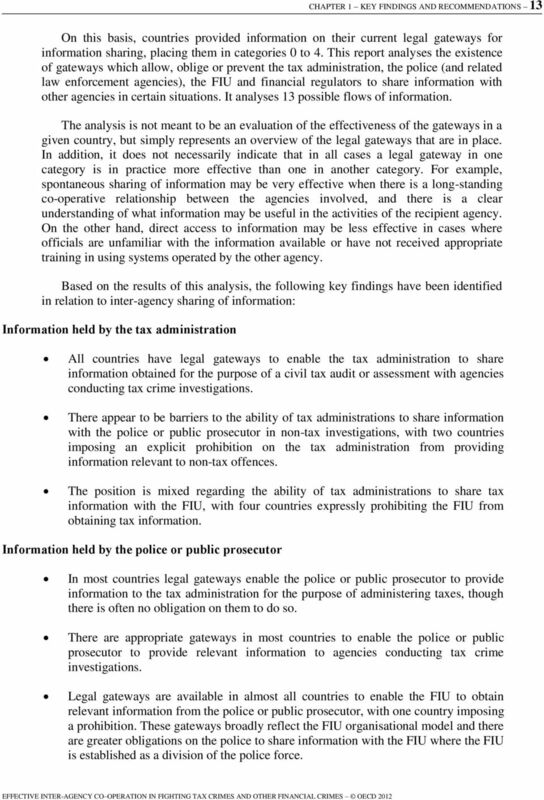 Based on the results of this analysis, the following key findings have been identified in relation to inter-agency sharing of information: Information held by the tax administration All countries have legal gateways to enable the tax administration to share information obtained for the purpose of a civil tax audit or assessment with agencies conducting tax crime investigations. There appear to be barriers to the ability of tax administrations to share information with the police or public prosecutor in non-tax investigations, with two countries imposing an explicit prohibition on the tax administration from providing information relevant to non-tax offences. The position is mixed regarding the ability of tax administrations to share tax information with the FIU, with four countries expressly prohibiting the FIU from obtaining tax information. Information held by the police or public prosecutor In most countries legal gateways enable the police or public prosecutor to provide information to the tax administration for the purpose of administering taxes, though there is often no obligation on them to do so. There are appropriate gateways in most countries to enable the police or public prosecutor to provide relevant information to agencies conducting tax crime investigations. Legal gateways are available in almost all countries to enable the FIU to obtain relevant information from the police or public prosecutor, with one country imposing a prohibition. These gateways broadly reflect the FIU organisational model and there are greater obligations on the police to share information with the FIU where the FIU is established as a division of the police force. 16 CHAPTER 1 KEY FINDINGS AND RECOMMENDATIONS 15 Transaction Reports. Specialists from the FIU and the tax administration meet regularly to discuss their analyses of Suspicious Transaction Reports and to co-ordinate investigations where evidence exists of both tax and non-tax offences, as well as discuss broader operational issues related to money laundering investigations. The FIU and tax administration also each attend feedback for between the other agency and businesses required to submit Suspicious Transaction Reports. This ensures the agencies display a united front in their dealings with the public. In Turkey, in 2009 and 2010 the FIU received Suspicious Transaction Reports related to possible usury carried out using Point of Sale (POS) machines. Specialists within the FIU analysed these reports and determined that, in addition to usury, the predicate offences underlying the Suspicious Transaction Reports included possible tax crimes. The FIU immediately shared its analysis with the Tax Inspection Board, which conducts tax crime investigations in Turkey. The Board started a number of investigations, during which officials identified additional unreported taxable income and evidence of tax offences. The Tax Inspection Board shared the results of its investigations with the FIU, which resulted in the FIU submitting the case to the public prosecutor s office for prosecution of money laundering offences. Access to Suspicious Transaction Reports for the tax administration (Australia): In Australia, the tax administration has a right of access to all FIU information, including direct access to all Suspicious Transaction Reports, via a secure online connection. This may be used for any purpose relating to the administration of taxes and the enforcement of tax law. The FIU also provides the tax administration with complete data sets of Suspicious Transaction Report information, which the tax administration uses in its automated data matching and data mining programmes. 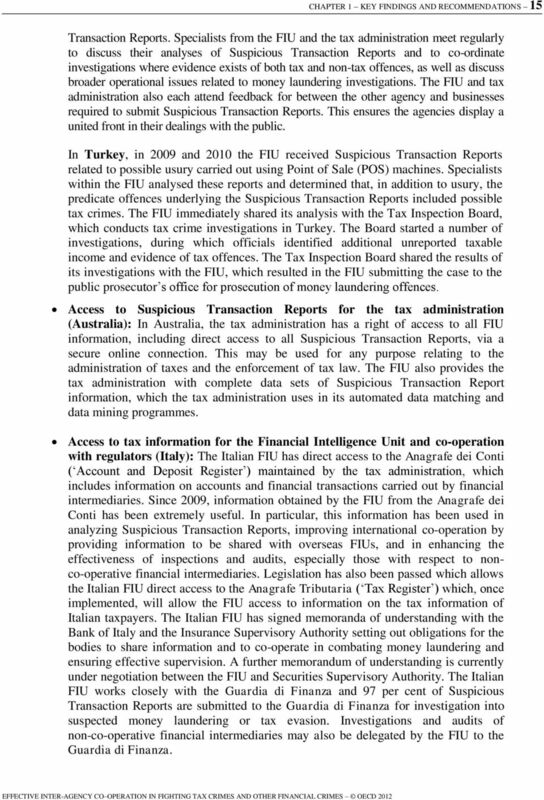 Access to tax information for the Financial Intelligence Unit and co-operation with regulators (Italy): The Italian FIU has direct access to the Anagrafe dei Conti ( Account and Deposit Register ) maintained by the tax administration, which includes information on accounts and financial transactions carried out by financial intermediaries. Since 2009, information obtained by the FIU from the Anagrafe dei Conti has been extremely useful. In particular, this information has been used in analyzing Suspicious Transaction Reports, improving international co-operation by providing information to be shared with overseas FIUs, and in enhancing the effectiveness of inspections and audits, especially those with respect to nonco-operative financial intermediaries. Legislation has also been passed which allows the Italian FIU direct access to the Anagrafe Tributaria ( Tax Register ) which, once implemented, will allow the FIU access to information on the tax information of Italian taxpayers. The Italian FIU has signed memoranda of understanding with the Bank of Italy and the Insurance Supervisory Authority setting out obligations for the bodies to share information and to co-operate in combating money laundering and ensuring effective supervision. A further memorandum of understanding is currently under negotiation between the FIU and Securities Supervisory Authority. The Italian FIU works closely with the Guardia di Finanza and 97 per cent of Suspicious Transaction Reports are submitted to the Guardia di Finanza for investigation into suspected money laundering or tax evasion. Investigations and audits of non-co-operative financial intermediaries may also be delegated by the FIU to the Guardia di Finanza. 18 CHAPTER 1 KEY FINDINGS AND RECOMMENDATIONS 17 well as information obtained from agencies. In some cases they access data through gateways available to participating agencies, while in other cases they have specific information gathering powers. By centralising these activities, officials within a centre gain experience of particular legal and practical issues, and specialised systems can be developed, which can increase their effectiveness. Cost savings may also be achieved, as the expense of collecting, processing and analysing data can be shared between participating agencies. Countries that make use of these strategies include Australia, Finland, India, the Netherlands, Sweden and the United States. Secondments and co-location of personnel: these are an effective way of enabling skills to be transferred while allowing personnel to build contacts with their counterparts in another agency. Seconded officials share their skills, experience and specialist knowledge while participating directly in the work of the host agency. Countries report that arrangements to co-locate and second staff have wider benefits for inter-agency co-operation, by encouraging officials to be more proactive in engaging with counterparts from other agencies and improving the effectiveness of co-operation that does take place. Countries that make use of these strategies include Australia, Belgium, Canada, Finland, France, Ireland, Italy, Japan, Korea, the Netherlands, Norway, Spain, the United Kingdom and the United States. 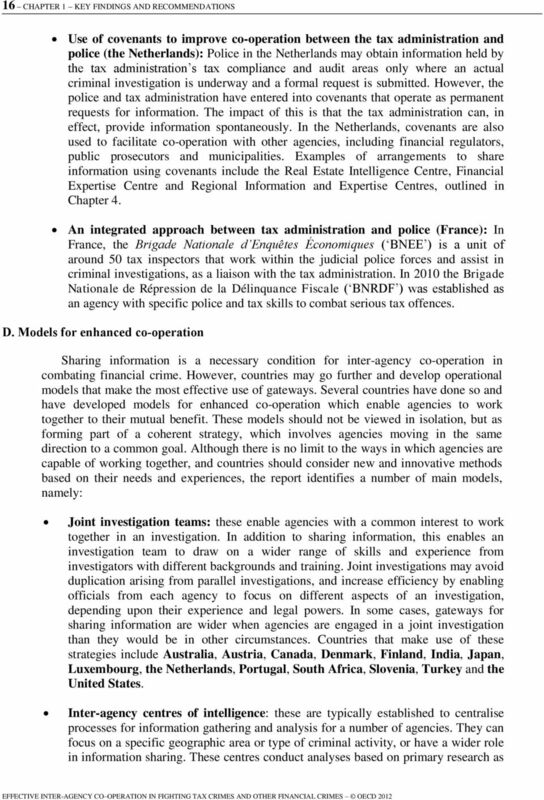 Other models: other strategies include the use of shared databases, dissemination of strategic intelligence products such as newsletters and intelligence briefs, joint committees to co-ordinate policy in areas of shared responsibility, and inter-agency meetings and training sessions to share information on trends in financial crime, guidance on investigative techniques and best practice in managing cases. Countries that make use of these strategies include Australia, Austria, Canada, the Czech Republic, Finland, India, Ireland, Italy, Japan, Luxembourg, the Netherlands, New Zealand, the Slovak Republic, South Africa, Turkey and the United States. E. Recommendations The whole-of-government approach to combating financial crime involves recognising that the activities of separate agencies do not operate in isolation. Officials in agencies including the tax administration, the customs administration, the FIU, the police and specialised criminal law enforcement agencies, the public prosecutor s office, and financial regulators recognise that the knowledge and skills required to combat financial crime are often spread across each of these agencies. Barriers to effective inter-agency co-operation prevent agencies responsible for combating financial crime from obtaining the benefit of this knowledge and skills. These barriers fall into three broad groups: legal; operational and political. Legal barriers include specific restrictions and prohibitions which apply to prevent an agency obtaining access to relevant information. Operational barriers include complex or lengthy procedures for obtaining information from another agency, a lack of awareness of the availability of information or other mechanisms for co-operation, or a lack of specialist training which reduces the effectiveness of gateways which do exist. Political barriers include a lack of support for agencies to adopt a whole-of-government approach, or to make the changes required to remove or reduce legal and operational barriers. 19 18 CHAPTER 1 KEY FINDINGS AND RECOMMENDATIONS Countries strategies have to operate within the broader context of their legal system, administrative practice and culture. It is up to each country to decide how to approach the issues addressed in this report and what strategies would be the most appropriate in the context of, and the most consistent with, its rules and framework. It is against this background that this report recommends that countries: 1. Review their models for sharing information among different agencies, in particular as regards: the ability of the tax administration to share information with agencies such as the police and the FIU; the possibility of introducing an obligation for the tax administration to report to the relevant law enforcement agency or the FIU evidence of any serious offence, suspected money laundering or terrorist financing activities, and to share information relevant to investigations into these offences or activities; and the ability of any agency which holds information relevant to the administration and assessment of taxes to make this information available to the tax administration. This applies in particular to information contained in Suspicious Transaction Reports. It is recommended that the tax administration be provided such information through direct access or through spontaneous exchange, as appropriate and applicable. In the latter case the FIU should have officials who are trained and experienced in recognising potential tax issues. 2. Review the models for enhanced co-operation described in this report, with a view to introducing and adapting them, as well as developing innovative models based on their particular needs, legal framework and experience. They should also consider ways in which processes for co-operation can be made more effective within existing frameworks. 3. Review the examples of successful practices identified in this report, with a view to introducing similar practices based on their particular needs, legal framework and experience. Where a particular successful practice is not appropriate because of a country s legal framework, it should consider alternative ways in which comparable benefits can be achieved. 4. Evaluate the legal and operational ability of the tax administration to be involved in tax crime investigations, where these are conducted by other agencies. 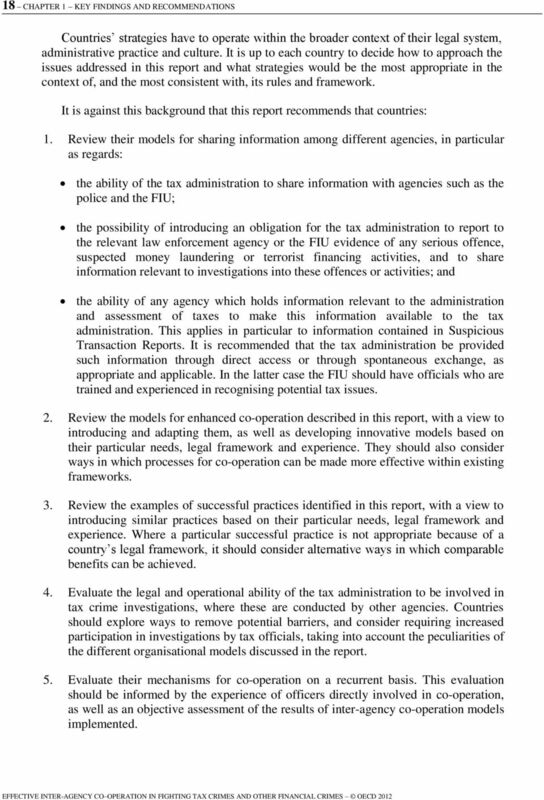 Countries should explore ways to remove potential barriers, and consider requiring increased participation in investigations by tax officials, taking into account the peculiarities of the different organisational models discussed in the report. 5. Evaluate their mechanisms for co-operation on a recurrent basis. This evaluation should be informed by the experience of officers directly involved in co-operation, as well as an objective assessment of the results of inter-agency co-operation models implemented. 20 CHAPTER 2 ORGANISATIONAL MODELS FOR AGENCIES FIGHTING FINANCIAL CRIME 19 Chapter 2 Organisational Models for Agencies Fighting Financial Crime Box 3. 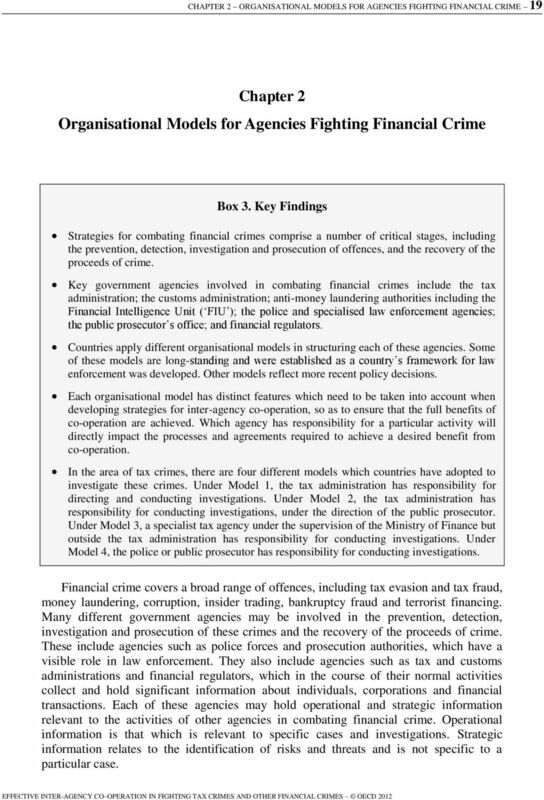 Key Findings Strategies for combating financial crimes comprise a number of critical stages, including the prevention, detection, investigation and prosecution of offences, and the recovery of the proceeds of crime. Key government agencies involved in combating financial crimes include the tax administration; the customs administration; anti-money laundering authorities including the Financial Intelligence Unit ( FIU ); the police and specialised law enforcement agencies; the public prosecutor s office; and financial regulators. Countries apply different organisational models in structuring each of these agencies. Some of these models are long-standing and were established as a country s framework for law enforcement was developed. Other models reflect more recent policy decisions. Each organisational model has distinct features which need to be taken into account when developing strategies for inter-agency co-operation, so as to ensure that the full benefits of co-operation are achieved. Which agency has responsibility for a particular activity will directly impact the processes and agreements required to achieve a desired benefit from co-operation. In the area of tax crimes, there are four different models which countries have adopted to investigate these crimes. Under Model 1, the tax administration has responsibility for directing and conducting investigations. Under Model 2, the tax administration has responsibility for conducting investigations, under the direction of the public prosecutor. Under Model 3, a specialist tax agency under the supervision of the Ministry of Finance but outside the tax administration has responsibility for conducting investigations. Under Model 4, the police or public prosecutor has responsibility for conducting investigations. Financial crime covers a broad range of offences, including tax evasion and tax fraud, money laundering, corruption, insider trading, bankruptcy fraud and terrorist financing. Many different government agencies may be involved in the prevention, detection, investigation and prosecution of these crimes and the recovery of the proceeds of crime. These include agencies such as police forces and prosecution authorities, which have a visible role in law enforcement. They also include agencies such as tax and customs administrations and financial regulators, which in the course of their normal activities collect and hold significant information about individuals, corporations and financial transactions. Each of these agencies may hold operational and strategic information relevant to the activities of other agencies in combating financial crime. Operational information is that which is relevant to specific cases and investigations. Strategic information relates to the identification of risks and threats and is not specific to a particular case. 21 20 CHAPTER 2 ORGANISATIONAL MODELS FOR AGENCIES FIGHTING FINANCIAL CRIME There is no single approach to how countries structure these agencies. Activities which are the responsibility of a particular agency in one country may be the responsibility of a different agency in a second country. Similarly, some countries may establish a number of independent agencies to carry out activities which in other countries are the responsibility of a single larger body. Understanding these differences is important to appreciate the implications of similarities and differences between countries arrangements for domestic inter-agency co-operation. Which agency has responsibility for a particular activity will directly impact the processes and agreements required to achieve a desired benefit from co-operation. For example, whether responsibility for investigating tax fraud lies with the tax administration, the police or a specific tax investigations authority directly impacts the arrangements with other agencies required to facilitate these investigations. The following paragraphs describe in general terms the role of different agencies in the countries covered by this report. A. Tax administration A country s tax administration is responsible for the assessment and collection of taxes on behalf of the government. This involves gathering and processing information on individuals and corporations subject to tax, including personal details, property ownership, investments, financial transactions and business operations. Tax administrations employ large numbers of trained specialists and investigators with experience in auditing and analysing financial data and investigating suspicious or anomalous transactions. Tax administrations often have extensive powers to access information and documentation from taxpayers and third parties. They typically play a central role in preventing and detecting tax crime. Once the suspicion of a tax crime exists, countries apply different models to determine the extent to which a tax administration may be involved in a subsequent investigation and prosecution. 6 Models for comparing tax administrations could be based on a number of criteria. 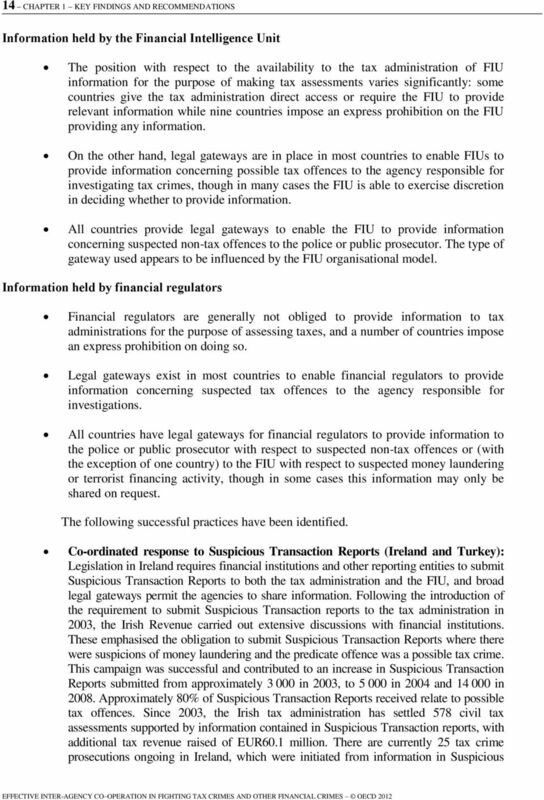 For the purposes of this report, the relevant criteria are those which might influence a tax administration s role in combating financial crime, and the ability of the tax administration (or other agency investigating tax crimes) to obtain information relevant to an investigation from other agencies. The Models applied below identify the agency which generally has responsibility for conducting investigations into tax offences. This is important in understanding which agency may require information for the purposes of conducting an investigation. The Models also identify those countries where these investigations are directed by a public prosecutor, and where they are wholly the responsibility of the investigating agency. This may be relevant in identifying additional gateways for obtaining relevant information, at the level of the prosecutor. Based on these criteria, four models have been identified as applying in the countries covered by this report in countering tax crimes. These are set out in the table below. 6. Tax administrations may in some cases also act in a supervisory capacity, monitoring compliance with money laundering regulations by businesses in certain sectors including real estate agents and traders accepting large cash payments. For example, this is the case in Luxembourg, the Netherlands and the United Kingdom. Second Edition Financial crimes are increasingly growing in sophistication. Criminals accumulate significant sums through offences including drug trafficking, fraud, extortion, corruption and tax evasion. Global Support to Develop Domestic Bond Markets in Emerging Market Economies and Developing Countries The Italian Experience.